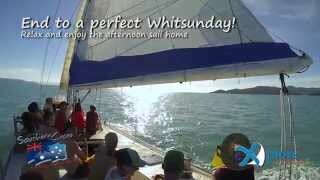 Explore Whitsundays offers day sailing tours on their famous Americas cup Challenger Southern Cross. A typical day will include sailing to Hill Inlet Lookout where guests can take an easy hike into the bush to see the magical white swirling sands of Whitehaven Beach. As soon as you arrive you will understand why it is the most photographed beach in Australia and has been named "Queensland's Most Beautiful Beach". They will also take you to an exclusive snorkelling location where you will have the opportunity to swim with thousands of species of tropical fish and see some of the most colourful soft and hard corals known to the fringing reef. Today, while Southern Cross still holds the spirit of a racing yacht, considerable modifications have been made to make it comfortable for guests, with features such as a shaded cockpit and downstairs lounge area and guest bathroom.